Courtesy of Joss & Main. Are you getting the most out of your outdoor space? When comfortable and well-decorated, your porch, patio, or deck can feel almost like an extension of your indoor living area — and this space can be just as useful, weather-permitting. The best outdoor rugs serve to tie your retreat together and help it to look (and feel) so much cozier. 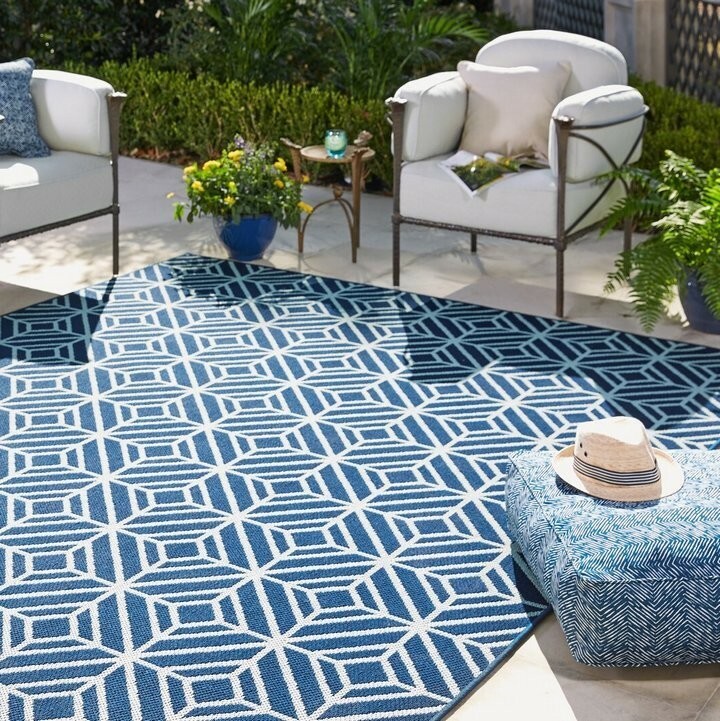 That said, not all outdoor rugs are created equal, and when choosing the right one, color and style shouldn't be the only factors on your mind. First thing's first: A rug for your yard or deck needs to be made out of the right materials. Most outdoor area rugs are created from synthetic fabrics (like nylon, polypropylene, or polyester), which can handle getting wet without turning into a sopping wad of moisture and mildew. Still, water's not the only element that your rug will need to endure. Because of the UV rays, sunlight can actually break down dyes in the fabric, which will cause colors to fade over time. That said, some rugs are colorfast; this means that, because the hues are part of the fibers rather than produced by an external dye, they'll resist fading in the presence of sunlight. If your rug of choice is particularly vivid (and you'd like to keep it that way), check to make sure that it can handle the rays long-term. Finally, you should consider the techniques that the manufacturers used to create the rug. Construction can make all the difference because it'll determine how durable your rug is, as well as how well it stands up to traffic. Flat-weave rugs are typically best for outdoors; they can be hand-woven or made on a machine, but either way, the tight fibers and lack of pile make them great for enduring moisture and high-traffic areas. Rugs with fluffy piles, on the other hand, will absorb dirt and water, so those are best kept inside. Not sure where to find a great outdoor rug for your space? We've researched ten of the best options the internet has to offer. Whether you're decorating your tropical poolside deck or your rustic cabin porch, these gorgeous, durable rugs are sure to tie the whole space together. 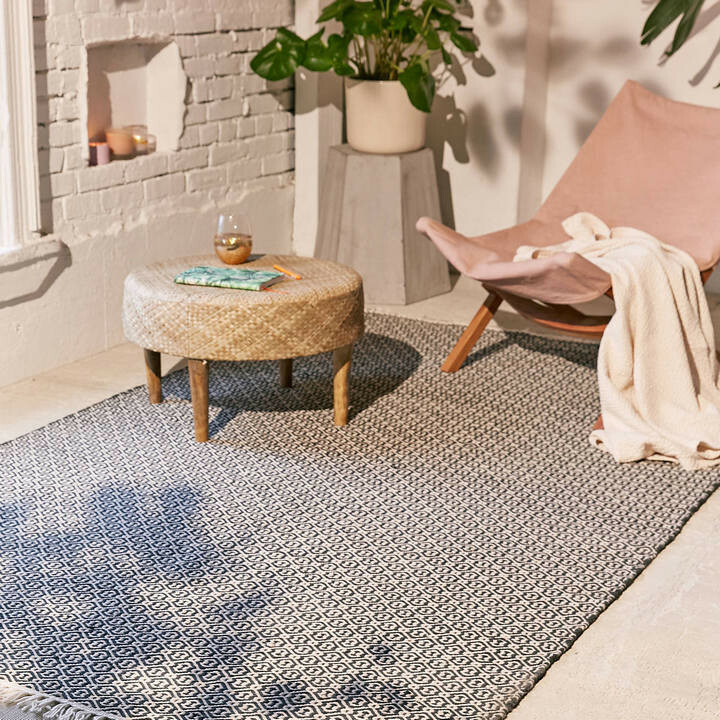 With well over 3,000 reviews, buyers are pretty thrilled with the Kulpmond braided rug — so thrilled, in fact, that they've opted to place this pick in just about every space imaginable, both inside and out. Buyers "love the natural feel," but despite the fact that it's cozy enough for the bedroom and formal enough for the dining room, the polypropylene fabric and braided construction also make it an ideal choice for your porch or deck. Thanks to the neutral grays and soft whites, this area rug will blend with a monochromatic color scheme and compliment rooms with brighter accents. That said, it offers one thing that most outdoor rugs don't: texture. Whether you choose the runner, the rectangle, the round, or the oval, the hand-braided rows and quarter-inch pile add some depth to your floors and help to scale the room. This pick is available in a huge selection of sizes (23, to be exact), and you can even get it in light blue and ivory, too. Last but not least, there's the price, which is pretty darn reasonable — especially considering the durability and longevity in high-traffic areas. Even when you opt for the largest size, which is 10 by 14 feet, this rug comes in at under $700. This rug is constructed from quality polypropylene and has a latex backing, which means it can handle moisture, dirt, and traffic. 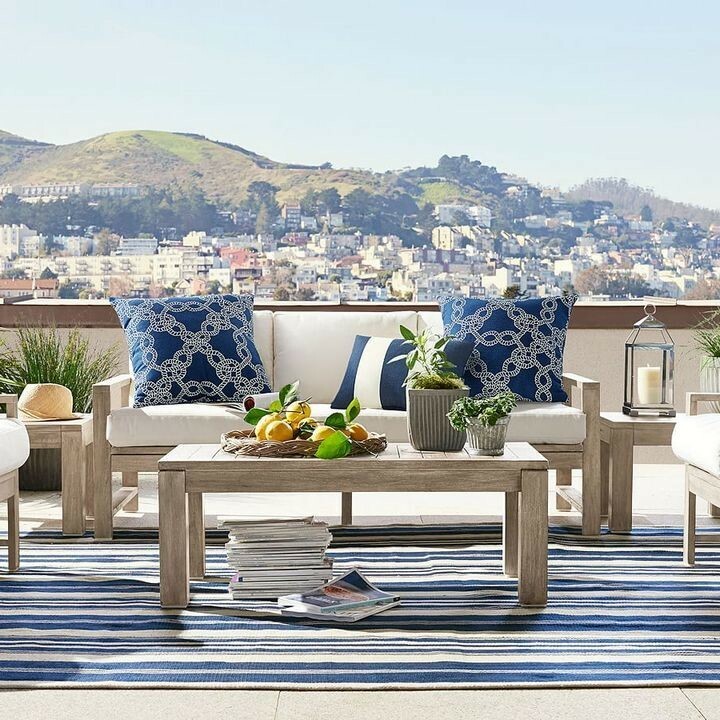 Its flat-weave, power-loom construction gives it a short pile, but the geometric pattern adds some contemporary depth to your outdoor sitting area. So far, this pick has a perfect five-star rating; reviewers say it looks "exactly like the pictures," and the "non-fading material" is an "excellent addition" to their patio. Outdoor decor is typically associated with summer, which usually means bold colors and busy patterns. A simple rug might make your decorating job a whole lot easier — and your space a whole lot more relaxing. 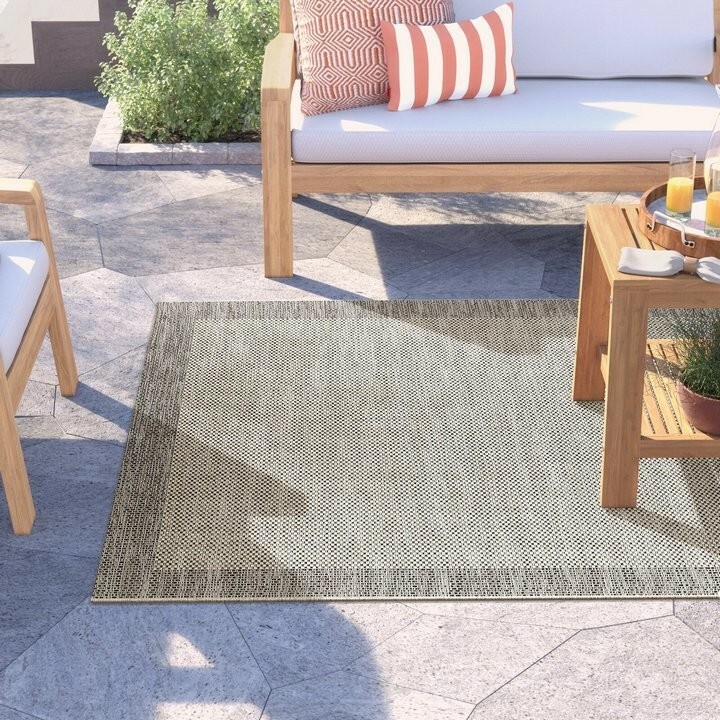 Muted, solid hues are one of the easiest way to compliment your theme of choice without having to worry about clashing, and this Acadia outdoor rug from Angela Adams is one of the best options out there. 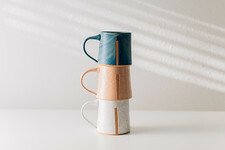 Inspired by the beauty of the Maine coastline, Angela Adams' pieces utilize the textures and natural colors that one might find in a sleepy, dock-side town. This rug in particular was inspired by Maine's Acadia National Park, and it's woven from UV-stable polypropylene that's resistant to moisture, sunlight, stains, and mildew. It's available in four sizes and three colors — Ocean, Granite, and Sunrise — and thanks to the barely-noticeable two-tone weave, all of them are extremely easy to incorporate into your space. "Simple" isn't only synonymous with "solid." You can opt for understated patterns that'll add some visual interest without monopolize the space. This Longwood rug from Urban Outfitters uses a small geometric print rather than a large, bold one, which can sometimes feel overwhelming (especially when you're decorating a smaller space). 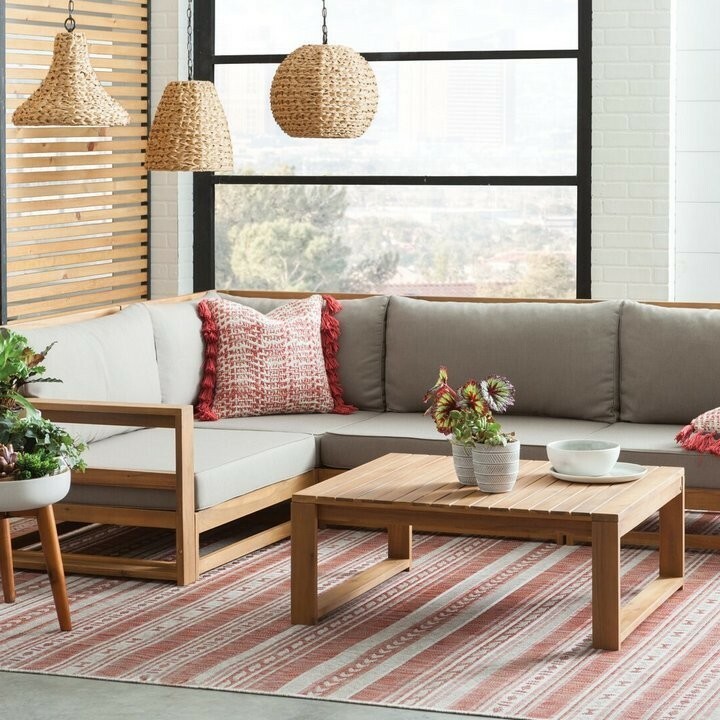 Thanks to its charming tassels and simple color scheme, this pick opts for a boho-inspired feel that's relaxed instead of flashy. Its hand-woven fabric is made from 100 percent recycled PET, which not only puts old water bottles to use, but will serve as a resilient barrier against dirt and moisture. If it needs a good cleaning at the end of the season, you can just add some detergent, hose it off, and hang it out to dry. You can get this rug in six different rectangular sizes, and since it uses an all black-and-white pattern, it goes with virtually any decor. While 2018 was all about Millennial pink, burnt orange is on the rise for 2019 — and its popularity is really no surprise. This color is bold and beautiful, but since it mimics the canyons of Arizona or a mountain forest in autumn, it still adds an earthy, natural feel to your home. Laurel Foundry's Alston rug highlights the shade, but does so in a muted, subtle way that works indoors or out. Threads of beige, brown, and red help to break up the orange and give this rug a weathered, rustic feel. As previously discussed, outdoor rugs shouldn't have significant piles, because more pile means more fabric to harbor dirt, moisture, and mildew. That said, the Chilewich Market Fringe rug looks like it actually belongs indoors. That's because the subtle variations in color make this rug look like it has a substantial, fluffy pile — not to mention the all-around tassels, which are an easy way to add a lived-in, bohemian feel to your space. Last but definitely not least, this piece is woven from vinyl yarns, which are soft and cozy, but still resistant to germs thanks to an anti-microbial treatment that prevents the growth of bacteria. You can purchase this rug in two sizes and three colors, including Quartz, Pacific, and Sangria. All of them feature the texture, warmth, and softness you'll need to make your outdoor space a little homier. If you're going for coastal, classy, and eco-friendly, look no further than the Oxford Stripe rug from Pottery Barn. 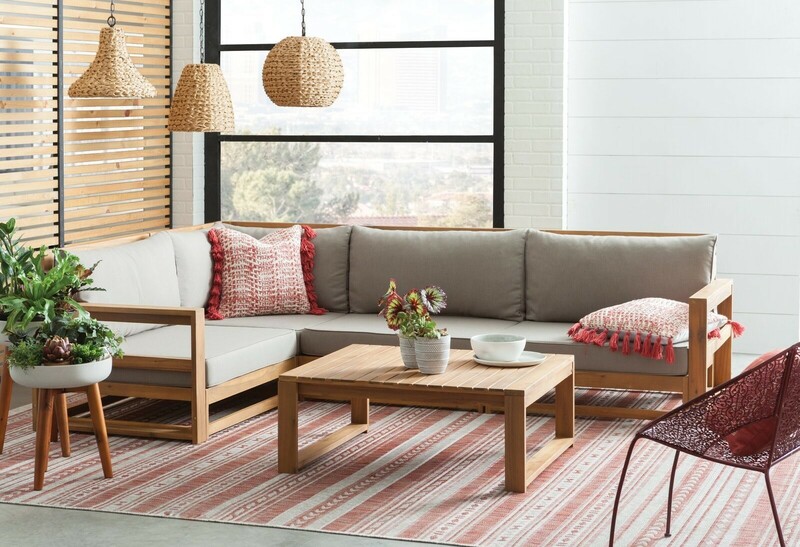 Thanks to this store's environmental commitment, they're constantly expanding their selection of rugs and textures that are made from recycled PET, which is created using old water bottles, packing material, and food containers. Instead of ending up in a landfill, this material is used for a gorgeous, durable area rug that ties in your beachy theme. Hand-woven and yarn-dyed, this pick is both foot-friendly and capable of handling lots of traffic. It features only off-white and navy blue, but the different-sized stripes help this rug to look a lot more intricate than it really is. In other words, it'll look like you painstakingly obsessed over the minute details, but in reality, this pick is a no-brainer that'll tie in virtually all shades of blues, browns, and grays. When striving to achieve a modern, earthy aesthetic, you should be looking for pieces that combine texture, clean lines, and a neutral palette. Design experts have called "greige" the "best neutral color ever" because it marries two of the most versatile hues in decorating. Since it helps to mute the undertones of both gray and beige, it's also capable of warming up cooler tones and cooling down warmer ones. The Alaia outdoor rug does all of the aforementioned while remaining resistant to weather, spills, and regular use. No wonder reviewers are saying, "I'm thinking about ordering another one to go under the breakfast table area." 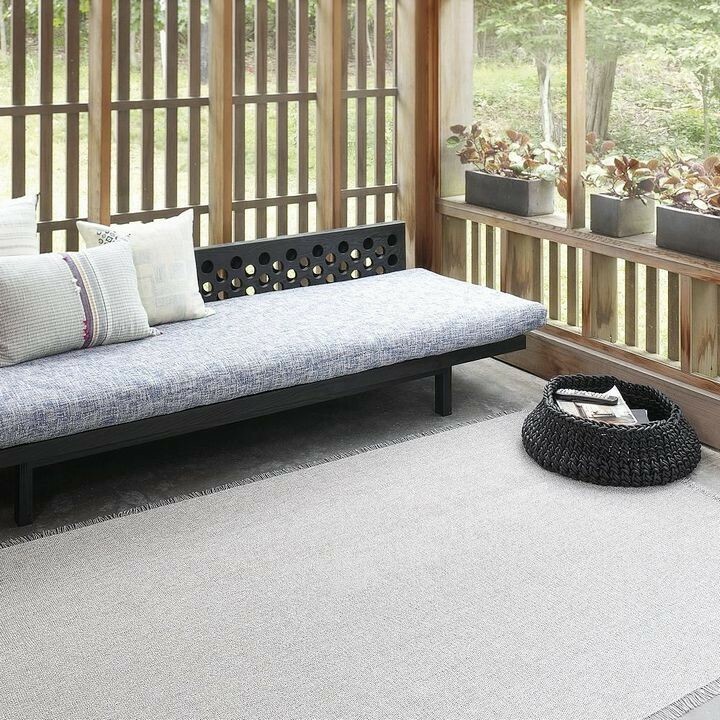 Because it's machine-woven from polypropylene and has a low, earthy pile, this rug compliments all the natural aspects of your outdoor space. 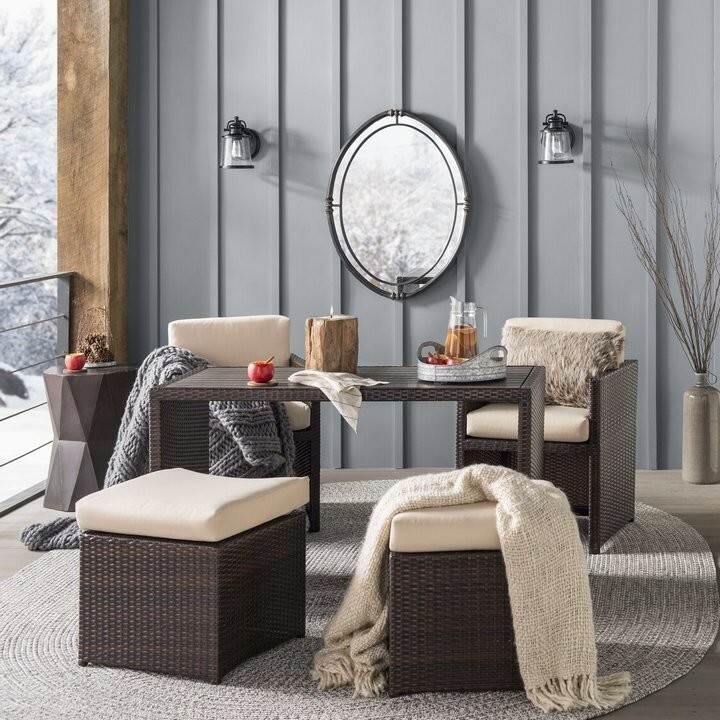 The color and simple bordering will blend well with dark woods as well as light ones, so no matter your preferred style of patio furniture, you can tie everything together in a cozy sitting area. It's even UV-protected, so you can expect the same easy-to-match greige for years to come. 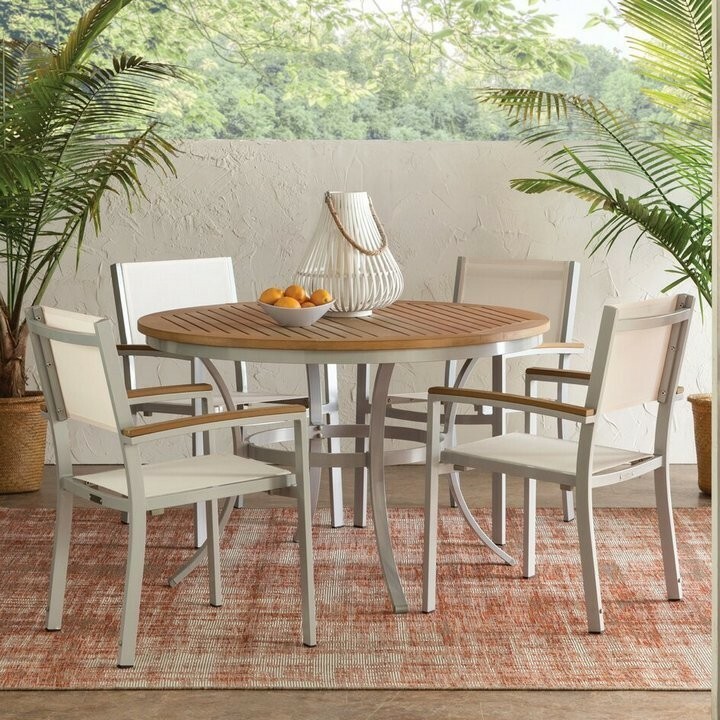 Designed by the Novogratz, this Tuscany outdoor rug combines a modern, rust-orange color with a striped pattern that's reminiscent of traditional Aztec designs. The result? A piece that accents your outdoor space without overwhelming it. While some people may be a little hesitant of the color, orange has a lot of power when used as the main design element of a room. Bright, vibrant shades can energize and inspire, while oranges that are darker and more muted can created a relaxed, lived-in feel. This rug does the latter. Speaking of relaxed, you won't have to worry about the durability of this option. It's made with polypropylene and features a power-loom weave, so it's washable as well as sturdy — and according to reviewers, it holds up "without being uncomfortable under foot." In fact, several buyers say that despite the mud, traction, and chewing from their pets, this pick still looks like new. Looking for something that's unlike anything else out there? This is the rug for you. 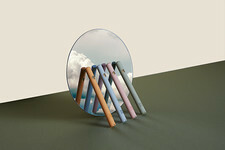 The Faz rug was created by Ramon Esteve, a Valencia-based company that designs unique pieces for unique spaces — as well as the spaces themselves. The Faz is representative of everything this company designs, from their eye-catching angles to their bold, modern aesthetic. In fact, this pick in particular was inspired by natural mineral formations, which are asymmetrical and periodic simultaneously. As a result, the piece makes visual sense, but still piques your interest. Even though this rug offers texture and comfort, it remains lightweight, weatherproof, and impact-resistant. It's available in three different color options that include various combinations of gray, white, black, brown, and gold, so you can match your existing decor while still accenting a particular color. We hope you're one step closer to the outdoor space of your dreams! So you know, Lonny may collect a share of sales from the links on this page.